This specification does not define a content protection or Digital Rights Management system. Rather, it defines a common API that may be used to discover, select and interact with such systems as well as with simpler content encryption systems. Implementation of Digital Rights Management is not required for compliance with this specification: only the simple clear key system is required to be implemented as a common baseline. This document was published by the HTML working group. Please submit comments regarding this document by using the W3C's (public bug database) with the product set to HTML WG and the component set to Encrypted Media Extensions. If you cannot access the bug database, submit comments to public-html-media@w3.org (subscribe, archives) and arrangements will be made to transpose the comments to the bug database. All feedback is welcome. Note: It is an open issue whether and how the spec should do more to encourage/ensure CDM-level interop. See Bug 20944. Note: This specification contains sections for describing security and privacy considerations. These sections are not final and are tracked in Bug 22909 and Bug 22910. Support simple decryption without the need for DRM servers, etc. Support a wide range of media containers and codecs. Stream reusability - the actual encrypted content stream/file for a given container/codec should be identical regardless of the user agent and content decryption and protection mechanism. Support a wide range of use cases. Flexibility (and control) for applications and content providers without requiring client/user agent updates. Minimize additions to HTMLMediaElement and new capabilities added to the user agent. Defer all information and algorithms about the content decryption and protection solution to the application/server and client content decryption module. The user agent should just pass information. The user agent should not be responsible for communication with license servers. The user agent should not select among content decryption and protection options. The application should make this decision. Note: Applications are already capable of everything required except secure decryption and decode. Text in this font and color is non-normative. The Content Decryption Module (CDM) is a generic term for a part of or add-on to the user agent that provides functionality for one or more Key Systems. Implementations may or may not separate the implementations of CDMs and may or may not treat them as separate from the user agent. This is transparent to the API and application. A user agent may support one or more CDMs. A Key System is a generic term for a decryption mechanism and/or content protection provider. Key System strings provide unique identification of a Key System. They are used by the user agent to select the Content Decryption Modules and identify the source of a key-related event. Simple Decryption Key Systems are supported by all user agents. User agents may also provide additional CDMs with corresponding Key System strings. A Key System string is always a reverse domain name. For example, "com.example.somesystem". Key System strings are compared using case-sensitive matching. It is recommended that CDMs use simple lower-case ASCII key system strings. A new Session ID will be generated each time createSession() successfully creates a MediaKeySession object. The user agent/CDM manage the lifetime of Session IDs. All Session IDs are cleared from the media element when a load occurs, although the CDM may retain them for longer periods. Each SessionID shall be unique within the browsing context in which it was created. If secure proof of key release is supported each Session ID shall be unique within the origin. Note that this last requirement implies that Session IDs shall be unique over time including across browsing sessions. Initialization Data is a generic term for container-specific data that is used by Content Decryption Modules to generate a key request. It should always allow unique identification of the key or keys needed to decrypt the content, possibly after being parsed by a CDM or server. Key Systems usually require a block of initialization data containing information about the stream to be decrypted before they can construct a key request message. This block could be as simple as a key or content ID to send to a server or as complex as an opaque Key System-specific collection of data. This initialization information may be obtained in some application-specific way or may be stored with the media data. Container formats may provide for storage of such information, possibly for multiple Key Systems in a single media file. Initialization data found in the media data is provided to the application in the initData attribute of the needkey event. This data has a container-specific format and is assumed to contain one or more generic or Key System-specific sets of initialization information. During playback, embedded media data is exposed to script in the embedding origin. In order for the API to fire needkey and keymessage events, media data must be CORS-same-origin with the embedding page. If media data is cross-origin with the embedding document, authors should use the crossorigin attribute on the media element and CORS headers on the media data response to make it CORS-same-origin. Note: For some CDMs, "key" and "key request" correspond to "license" and "license request", respectively. The keys attribute is the MediaKeys being used when decrypting encrypted media data for this media element. If loading has not started, throw an INVALID_ACCESS_ERR exception and abort these steps. In general, applications should wait for an event named needkey or loadstart (per the resource fetch algorithm) before calling this method. If the MediaKeys object is already in use and the user agent is unable to re-use it with this element, throw a QUOTA_EXCEEDED_ERR exception and abort these steps. Set the keys attribute of the media element to mediaKeys. Note: In some implementations, MediaKeySession objects created by createSession() may not fire any events until the MediaKeys object is associated with a media element with setMediaKeys(). The onneedkey event handler for the needkey event must be supported by all HTMLMediaElements as both a content attribute and an IDL attribute. If keySystem is null or an empty string, throw an INVALID_STATE_ERR exception and abort these steps. If keySystem is not one of the user agent's supported Key Systems, throw a NOT_SUPPORTED_ERR and abort these steps. Key system string comparison is case-sensitive. Let cdm be the content decryption module corresponding to keySystem. Bug 20991 - The CDM should be loaded asynchronously. Set the new object's error attribute to the error object created in the previous step. queue a task to fire a simple event named keyerror at the new object. Create a new MediaKeys object. Let the keySystem attribute be keySystem. When destroying a MediaKeys object, follow the steps in close(). The keySystem attribute is an identifier for the Key System being used. Note: The contents of initData are container-specific Initialization Data. If type contains a MIME type that is not supported or is not supported by the keySystem, throw a NOT_SUPPORTED_ERR exception and abort these steps. Let cdm be the cdm loaded in the MediaKeys constructor. Create a new MediaKeySession object. Let the sessionId attribute be a unique Session ID string. It may be generated by cdm. Let the state of the session be CREATED. Add the new object to an internal list of session objects. Schedule a task to generate a key request, providing type, initData, and the new object. Let key request be a key request generated by the CDM using initData, if provided. The key request may be empty if the CDM does not need a message exchange. Note: cdm must not use any stream-specific data, including media data, not provided via initData. type may be used to determine how to interpret initData. If initData contains a default URL for keySystem, let defaultURL be that URL. Set the MediaKeySession object's error attribute to the error object created in the previous step. Let the state of the session be ERROR. queue a task to fire a simple event named keyerror at the MediaKeySession object. Let the state of the session be PENDING. queue a task to fire a simple event named keymessage at the new object. Note: message may be a request for multiple keys, depending on the keySystem and/or initData. This is transparent to the application. Let the state of the session be READY. queue a task to fire a simple event named keyready at the new object. The isTypeSupported(keySystem, type) method returns whether keySystem is supported with the specified container and codec type(s). The following list shows some examples. Returns whether the Some System Key System is supported. Specific containers and codecs may or may not be supported with Some System. Returns whether the Some System Key System is present and supports the container and codec(s) specified by mimeType. Returns whether the user agent supports Clear Key Simple Decryption of the container and codec(s) specified by mimeType. If keySystem contains an unrecognized or unsupported Key System, return false and abort these steps. Key system string comparison is case-sensitive. If type is null or an empty string, return true and abort these steps. If the Key System specified by keySystem does not support decrypting the container and/or codec specified by type, return false and abort these steps. The error attribute is a MediaKeyError representing the current error state of the session. It is null if there is no error. The sessionId attribute is the Session ID for this object and the associated key(s) or license(s). Note: The contents of key are keySystem-specific. It may be a raw key or a license containing a key. The contents may also vary depending on the container, key length, etc. If the argument is null or an empty array, throw an INVALID_STATE_ERR. If the session is not in the PENDING state, throw an INVALID_ACCESS_ERR. Schedule a task to handle the call, providing key. Let did store key be false. Let next message be null. Use cdm to handle key. Note: For some Key Systems, key may be a license or other structure containing multiple keys. For each individual key in key, store the individual key. Let key ID be the key ID associated with the individual key. If a stored key already exists for key ID, delete that key. Store the individual key, license, and/or license information indexed by key ID. The replacement algorithm is Key System-dependent. Note: It is recommended that CDMs support a standard and reasonably high minimum number of cached keys/licenses (with IDs) per MediaKeySession object as well as a standard replacement algorithm. This enables a reasonable number of key rotation algorithms to be implemented across user agents and may reduce the likelihood of playback interruptions in use cases that involve various streams in the same element (i.e. adaptive streams, various audio and video tracks) using different keys. Let did store key be true. If another message needs to be sent to the server, let next message be that message. If did store key is true and the media element is waiting for a key, queue a task to attempt to resume playback. In other words, resume playback if the necessary key is provided. If next message is not null and the media data is not CORS-same-origin, jump to the Error step below and perform the task failed steps. If next message is not null, queue a task to fire a simple event named keymessage at the MediaKeySession object. If next message is null, let the state of the session be READY and queue a task to fire a simple event named keyready at the MediaKeySession object. If did store key is true, queue a task to fire a simple event named keyadded at the MediaKeySession object. The key acquisition process may involve the web page handling keymessage events, sending the message to a Key System-specific service, and calling update with the response message. update calls may generate keyadded or keymessage events. During the process, the web page may wish to cancel the acquisition process. For example, if the page cannot contact the license service because of network issues it may wish to fallback to an alternative key system. The page calls close() to cancel the a key acquisition session. Clear any internal state associated with the session, including all keys and licenses. ⌛ If candidate has a keySystem attribute whose value represents a Key System that the user agent knows it cannot use with type, then end the synchronous section, and jump down to the failed step below. Bug 21798 - Some errors may change or be removed. MediaError is extended, and a new error type is added. Returns the current error's system code. 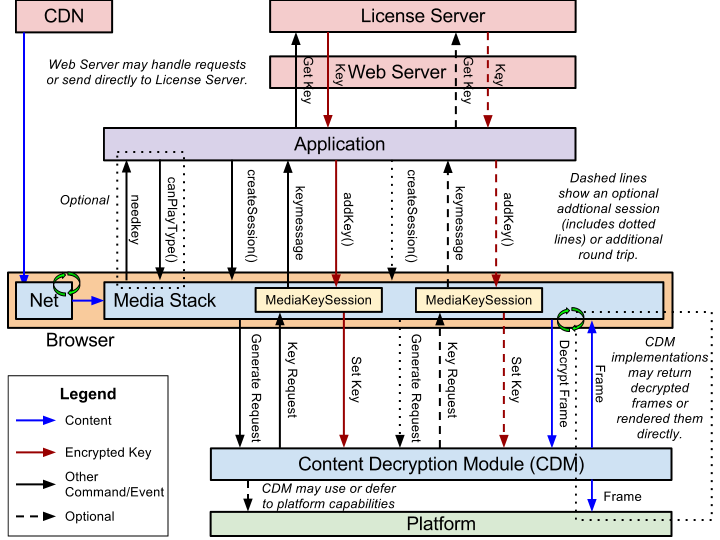 Applications that support encrypted media should provide a needkey handler and/or call setMediaKeys() no later than when media data is provided. If the user agent does not support decryption of this media data, it should report the same error it would for any other unsupported media data (e.g. MEDIA_ERR_SRC_NOT_SUPPORTED). An unspecified error occurred. This value is used for errors that don't match any of the following codes. The Key System could not be installed or updated. The message passed into update indicated an error from the license service. There is no available output device with the required characteristics for the content protection system. A hardware configuration change caused a content protection error. An error occurred in a multi-device domain licensing configuration. The most common error is a failure to join the domain. The systemCode attribute of a MediaKeySession object is a Key System-dependent status code for the error that occurred. This allows a more granular status to be returned than the more general code. It should be 0 if there is no associated status code or such status codes are not supported by the Key System. Each MediaKeySession maintains an internal state that determines what events may be fired. CREATED The MediaKeySession has been created with a createSession() call. PENDING A keymessage event has been fired at the MediaKeySession. A call to update() is expected next. The media element may block waiting for a key if encrypted data is encountered. READY A keyready event has been fired at the MediaKeySession. The media element should not need to block waiting for a key if encrypted data associated with this session is encountered. ERROR A keyerror event has been fired at the MediaKeySession. The error attribute of the session holds information about the most recent error. Where media rendering is not performed by the UA, for example in the case of a hardware protected media pipeline, then the full set of HTML rendering capabilities, for example CSS Transforms, may not be available. One likely restriction is that video media may be constrained to appear only in rectangular regions with sides parallel to the edges of the window and with normal orientation. Returns the URL to send the message to. Returns the Initialization Data related to the event. Returns the MIME type of the media data related to the event. Returns the message (i.e. key request) to send. The initData attribute contains Initialization Data specific to the event. The type attribute contains the MIME type of the media data specific to the event. The format of the initData will depend on the type. The message attribute contains a message from the CDM. Messages are Key System-specific. In most cases, it should be sent to a key server. The destinationURL is the URL to send the message to. An application may override this. In some cases, it may have been provided by the media data. It may be null. If a response (i.e. a license) is necessary, applications should use one of the new methods to provide the response. The following events are fired at MediaKeySession. keyadded Event A key has been added as the result of a update() call. keyerror Event An error occurs in the session. The session moves to the ERROR state. keymessage MediaKeyMessageEvent A message has been generated (and likely needs to be sent to a server). For example, a key request has been generated as the result of a createSession() call or another message must be sent in response to an update() call. The session moves to the PENDING state. keyready Event The media element should not be blocked if encrypted data is encountered associated with the initData used to create the session. The session moves to the READY state. The following event is fired at HTMLMediaElement. needkey MediaKeyNeededEvent The user agent needs a key or license to begin or continue playback. It may have encountered media data that may/does require decryption to load or play OR need a new key/license to continue playback. readyState is equal to HAVE_METADATA or greater. It is possible that the element is playing or has played. If Initialization Data was encountered, let initData be that initialization data. Jump to the Need Key step below. Let key ID be null. If a key ID for the source is known at this time, let key ID be that ID. If initData is not null and contains a key ID, let key ID be that ID. Jump to the Continue Normal Flow step below. Queue a task to fire a simple event named needkey at the media element. Abort media element's resource fetch algorithm and run the steps to report a MEDIA_ERR_ENCRYPTED error. Firing this event allows the application to begin acquiring the key process before it is needed. Note that readyState is not changed and no algorithms are aborted. This event is merely informative. Jump to the Key Presence step below. Let block key ID be be the key ID for the current block. If cdm has a key cached for block key ID, let block key be the matching cached key. If cdm is not null and block key is not null. Note: Not all decryption problems (i.e. using the wrong key) will result in a decryption failure. In such cases, no error is fired here but one may be fired during decode. The media element is said to be potentially playing unless playback stops because the stream cannot be decrypted, in which case the media element is said to be waiting for a key. The following paragraph is added to Playing the media resource. A media element is said to be waiting for a key when it would be potentially playing but the user agent has reached a point in the media resource that must be decrypted for the resource to continue and the CDM does not have the necessary key. The media element leaves this state when seeking but could re-enter it if the same conditions exist. Clear the keys attribute for this media element. Note: it is an open issue whether further normative specification of this feature is required. See Bug 17199. The above sections provide for delivery of key/license information to a Content Decryption Module. This section provides for management of the entire key/license lifecycle, that is, secure proof of key release. Use cases for such proof include any service where is it necessary for the service to know, reliably, which granted keys/licenses are still available for use by the user and which have been deleted. Examples include a service with restrictions on the number of concurrent streams available to a user or a service where content is available on a rental basis, for use offline. Secure proof of key release must necessarily involve the CDM due to the relative ease with which scripts may be modified. The CDM must provide a message asserting, in a CDM-specific form, that a specific key or license has been destroyed. Such messages must be cached in the CDM until acknowledgement of their delivery to the service has been received. This acknowledgement must also be in the form of a CDM-specific message. The mechanism for secure proof of key release operates outside the scope of any media element. This is because proof-of-release messages may be cached in CDMs after the associated media elements have been destroyed. Proof-of-key-release messages are subject to the same origin policy: they shall only be delivered to scripts with the same origin as the script which created the media element that provided the key/license. All user agents must support the simple decryption capabilities described in this section regardless of whether they support a more advanced CDM. This ensures that there is a common baseline level of protection that is guaranteed to be supported in all user agents, including those that are entirely open source. Thus, content providers that need only basic protection can build simple applications that will work on all platforms without needing to work with any content protection providers. The "org.w3.clearkey" Key System indicates a plain-text clear (unencrypted) key will be used to decrypt the source. No additional client-side content protection is required. Use of this Key System is described below. The keySystem parameter and keySystem attributes are always "org.w3.clearkey". The sessionId string is numerical. The initData attribute of the needkey event and the initData parameter of createSession() are the same container-specific Initialization Data format and values. If supported, these values should provide some type of identification of the content or key that could be used to look up the key (since there is no defined logic for parsing it). For containers that support a simple key ID, it should be a binary array containing the raw key ID. For other containers, it may be some other opaque blob or null. message = a container-specific value extracted from the initData parameter of createSession(). null if initData was null or a value could not be extracted. destinationURL = value of the default URL if present in the media data and null otherwise. The key parameter of update() should be a JSON Web Key (JWK) representation of the symmetric key to be used for decryption, as defined in the IETF Internet-draft JSON Private and Symmetric Key specification. The JSON string is encoded into the Uint8Array parameter using ASCII-compatible character encoding. When the JWK 'key type' ("kty") member value is 'octet sequence' ("oct"), the 'key value' ("k") member will be a base64 encoding of the octet sequence containing the symmetric key value. For example, the following contains a single symmetric key represented as a JWK, designated as being for use with the AES Key Wrap algorithm (line breaks for readability, only). Bug 20965 - EME results in a loss of control over security and privacy. Bug 22909 - Needs non-normative Security Considerations section. Bug 22910 - Needs non-normative Privacy Consideration section. Malicious applications may be able to fingerprint users or user agents by detecting or enumerating the list of key systems that are supported. If user agents permit keys to be re-used between origins, without performing any secondary operations such as key derivation that includes the origin, then it may be possible for two origins to collude and track a unique user by recording their ability to access a common key. With the exception of ephemeral keys, its often desirable for applications to strongly associate users with keys. These associations may be used to enhance the security of authenticating to the application, such as using a key stored in a secure element as a second factor, or may be used by users to assert some identity, such as an e-mail signing identity. As such, these keys often live longer than their counterparts such as usernames and passwords, and it may be undesirable or prohibitive for users to revoke these keys. Because of this, keys may exist longer than the lifetime of the browsing context and beyond the lifetime of items such as cookies, thus presenting a risk that a user may be tracked even after clearing such data. This is especially true for keys that were pre-provisioned for particular origins and for which no user interaction was provided. This document describes behavior independent of specific media containers. The following sections provide container-specific details for implementations that choose to support those containers. This section defines the stream format and Initialization Data for implementations that choose to support WebM. Encrypted WebM streams are encrypted at the block level with AES-128 CTR encryption. The container shall include appropriate values within the ContentEncryption element. WebM streams may be partially encrypted, both at the Track level and the block level. In the former case, a subset of Tracks in the stream have a ContentEncryption element. In the latter case, a subset of the blocks within a Track containing a ContentEncryption element are marked as encrypted. When a WebM Track is parsed, the presence of a ContentEncKeyID element shall indicate that the stream is potentially encrypted. Each time a new value is encountered in a ContentEncKeyID element, the First Time a Key Reference is Encountered algorithm shall be invoked with the value in that element as initData. Encrypted blocks are those marked encrypted by the Signal Byte. Initialization Data in events is always a key ID, which is the ContentEncKeyID of the current Track. The current Track is the one being parsed or that contains the block being decrypted. Events only contain a single key ID. However, if supported by the key system, multiple key IDs may be bundled by the application before requesting a key and multiple key ID-key pairs may be returned by the license server. An event will be fired for each new key ID (in ContentEncKeyID) encountered for which a key is not already known. Note: There is an open issue about how initialization data should be extracted from ISO BMFF content. See Bug 17673. This section defines the stream format and initialization data for ISO Base media File Format (ISOBMFF) content. The stream format is dependent upon the protection scheme, as defined in the scheme type box ('schm'). For example, under the common encryption ("cenc") protection scheme, ISOBMFF content is encrypted at the sample level with AES-128 CTR encryption, according to ISO/IEC 23001-7:2012, "Information technology - MPEG system technologies - Part 7: Common encryption in ISO base media file format files". This protection method enables multiple Key Systems to decrypt the same media content. Protection scheme signaling conforms with ISO/IEC 14496-12. When protection has been applied, the stream type will be transformed to 'encv' for video or 'enca' for audio, with a scheme information box ('sinf') added to the sample entry in the sample description box ('stsd'). The scheme information box ('sinf') will contain a scheme type box ('schm') with a scheme_type field set to the 4CC value of the protection scheme. Additionally, if the protection scheme is common encryption ("cenc"), the "encrypted block" is a sample. Determining whether a sample is encrypted depends on the corresponding track encryption box ('tenc') and the sample group associated with the sample. In this case the default encryption state of a sample is defined by the IsEncrypted flag in the associated track encryption box ('tenc'). This default state may be modified by the IsEncrypted flag in the Sample Group Description Box ('sgpd'), pointed to by an index in the Sample to Group Box ('sbgp'). For complete information about "cenc" see ISO/IEC 23001-7:2012. For ISOBMFF the InitData begins with a the protection scheme information box ('sinf'). The 'sinf' includes the scheme type box ('schm'), giving the scheme_type, and the scheme information box ('schi'). If this scheme_type is common encryption ("cenc"), the scheme information box will also contain the track encryption box ('tenc'), giving the defaults for IsEncrypted, IV_size and KID for that track. In addition, one or more protection system specific heder boxes ('pssh') will be concatenated after the 'sinf' box. In a file encrypted with common encryption, each key is identified by a Key ID and each encrypted sample is associated with the Key ID of the key needed to decrypt it. This association is signaled either through the specification of a default Key ID in the track encryption box ('tenc') or by assigning the sample to a Sample Group, the definition of which specifies a Key ID. Common encryption files may contain a mixture of encrypted and unencrypted samples. Playback of unencrypted samples should not be impeded by unavailability of the keys needed to decrypt other samples in the same file or track. Note that if there is already an active Key System CDM and the key storage for that Key System already contains the key associated with the Key ID, there is no need to generate a needkey event. This section and its subsections are non-normative. In this simple example, the source file and clear-text key are hard-coded in the page. This example is very simple because it does not care when the key has been added or associating that event with the update() call. It also does not handle errors. In this case, the Initialization Data is contained in the media data. If this was not the case, handleKeyNeeded() could obtain and provide it instead of getting it from the event. This solution uses the Clear Key Simple Decryption. As with the previous example, this one is very simple because it does not care when the key has been added or handle errors. This solution uses more advanced decryption from a fictitious content decryption module called Some System. Below is an example of detecting supported Key System using the isTypeSupported() and selecting one. licenseUrl = "https://license.example.com/getkey"; // OR "https://example.<My Video Site domain>"
Note that handleKeyMessage could be called multiple times, including in response to the update() call if multiple round trips are required and for any other reason the Key System might need to send a message. // Do some bookkeeping with event.target.sessionId if necessary. // and do some bookkeeping with event.target.sessionId if necessary. selectKeySystem();  // See previous example for implementation.